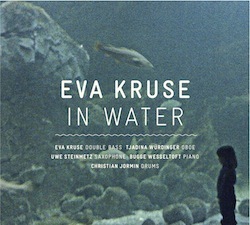 In February 2013 we recorded IN WATER. Outside of Gothenborg/ Sweden we were at the great Bohus Sound Recording Studios and had the honor to work with soundengineer Ake Linton who always has finetuned wide open ears for the music and the creation of the best acoustic sound possible. Tjadina, Uwe, Bugge, Christian and me rehearsed for a day in our living-room and then went for the exciting and inspiring trip to two days of studio-adventure. I am very happy with the result and thank you all for your great music, commitment and support!